Nearly zero distortion when light go through this HD filter. With only 2.3mm thickness and made with no compromise, this ND1000 might be the thinnest and the best in the world. All Materials Used in this filter Meet the Requirements of European Union’s standards of Environ Ment Protection-ROHS(Restrictions on Hazardous Substances). 1.Double Side Anti-Reflection Coating, Super Water & Stain Resistant. 2.10 Stop Exposure, No Color Cast, Top Smooth finish on The Surface. 3.Made from original high quality Japanese optical HD glass and film. 4.All Materials Used in this filter Meet the Requirements of European Union’s standards of Environment Protection-ROHS(Restrictions on Hazardous Substances). 5.Works with any digital camera, for JPEG and RAW files certified performance and quality. 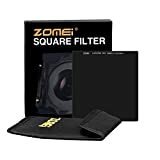 When you use these filters you need to use with a 4X4″ filter holder and a adapter ring that fit your lens diameter. This entry was posted in Discount Photography and tagged 100mm, 10stop, Density, Filter, Glass, Gray, Layer, lens, MultiCoated, ND1000, Neutral, SCHOTT, Series, Slim, Square, Super, Ultra, Zomei, ZPRO by Ball Photo. Bookmark the permalink.